This is Standard class room. It was made in light blue color, which allows you to create a neutral atmosphere and get relax. A pale-pink accessories add warm notes to design. Big king-size bed is situated in the center of the room. 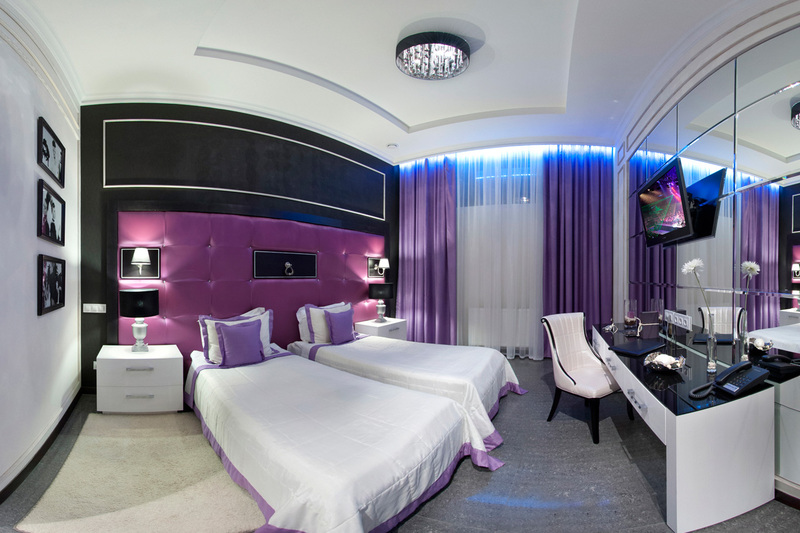 Walls on both sides of the bed are decorated with mirrors. 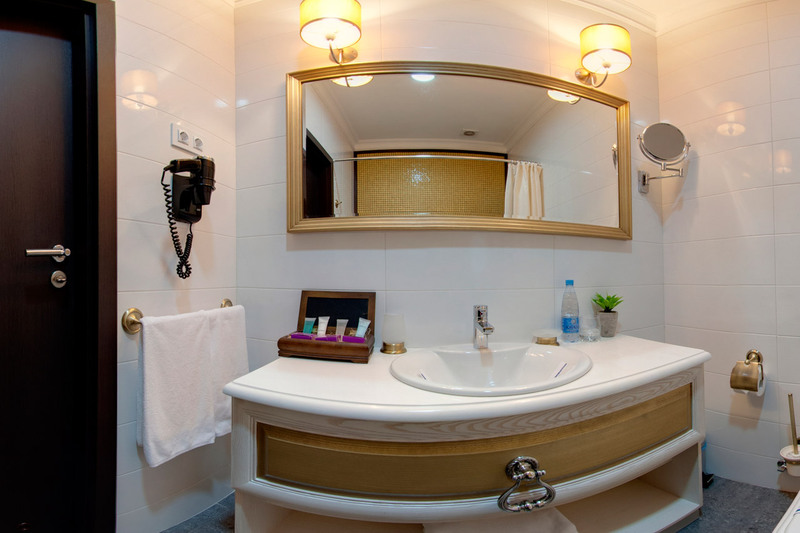 The bathroom has a spacious shower, comfortable washbasin, and large mirror. bath accessories, hair dryer, etc. Bed Size: 1 Extra large (Super-king size: 180×200). 1780 UAH (per 2 persons). Best price guarantee on reservations via official Mirax Hotels website! This is Standard class room. A feature of this room is in its ability to convert it to double bed room. Wide bed very easily transformed into two independent and comfortable place to sleep. Accessories create a special atmosphere of luxury and comfort. There is plasma TV on the mirrored wall in front of the bed. The bathroom has a spacious shower. This number is rich on luxurious accessories. It is likely to appeal for lovers of luxury and elegance. Everything here is in contrast with each other. 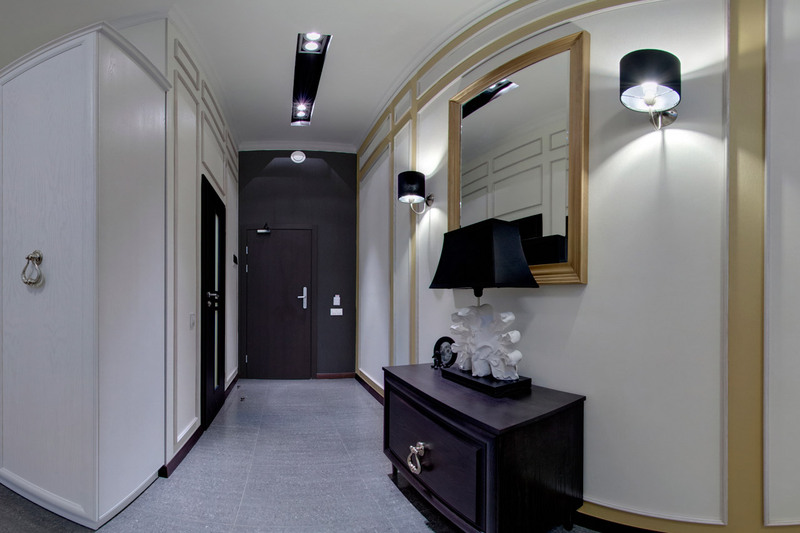 Matt black floor contrast with a mirror walls, snow-white furniture – with a red interior details. 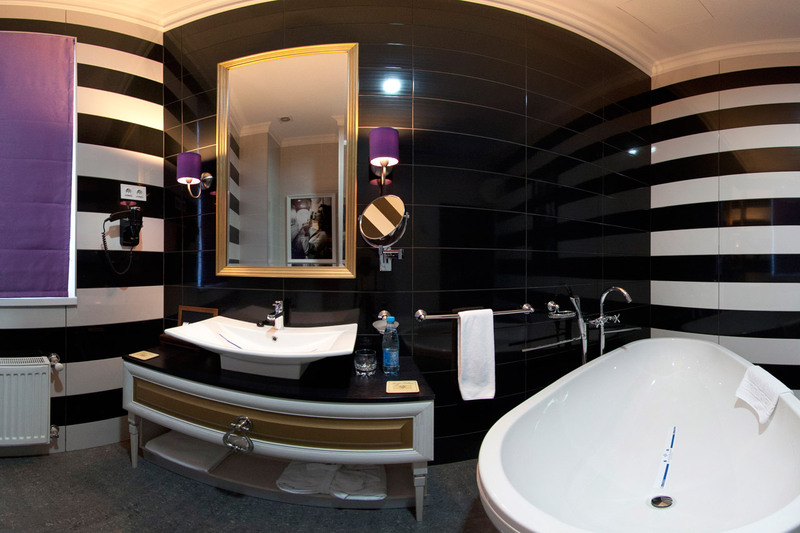 Special grace attached bath with the lion legs, which is located in the relaxation zone. Nothing extra – just black, white, gold and portrait of inimitable Marilyn Monroe. 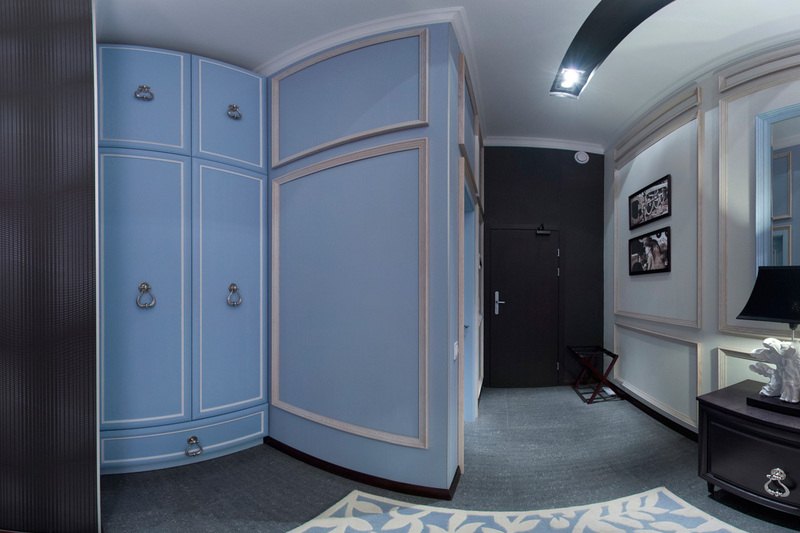 Like a great actress who could do great effect from nothing – room contain modesty and elegance against the backdrop of luxurious furniture and decoration. 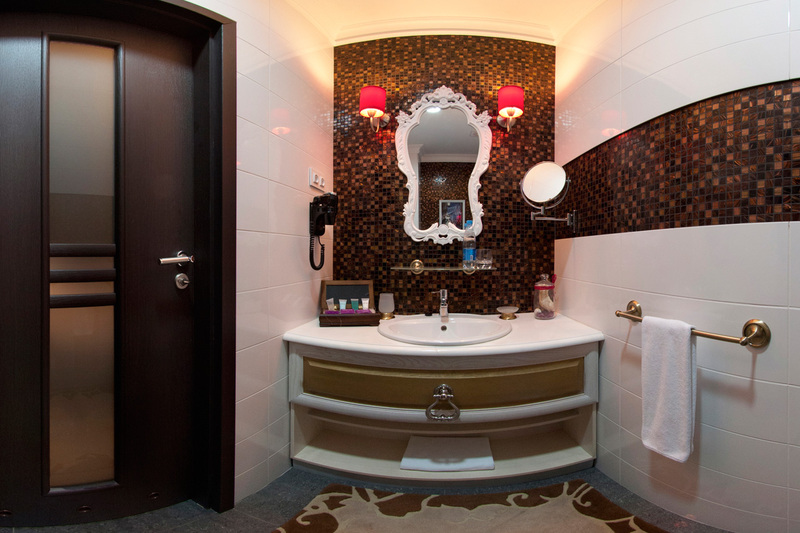 Walls in bathroom are decorated with sun-gold mosaics, pearl tub installed in the lion legs. Spacious room with elegant interiors, flat-screen TV and a kettle. 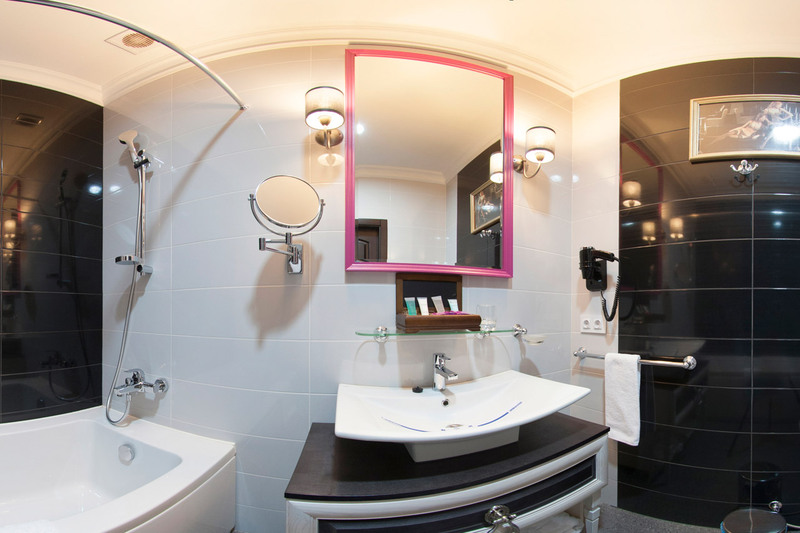 A hairdryer and toiletries are provided in the modern bathroom. 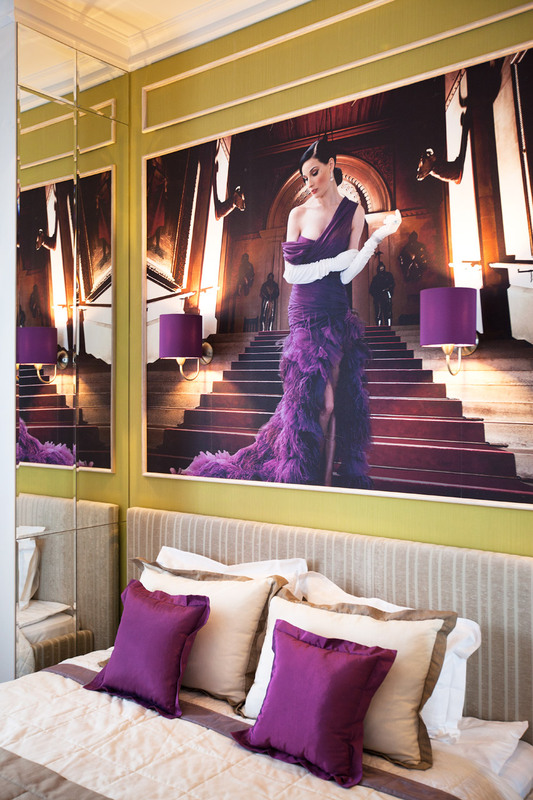 Chic and glamour – these words come to mind, when you make step inside this number. As a result of the confluence of the blue and red, hot and cold – it has strong internal inconsistency. Different stylish furniture make special perfection – small tables, a couch, the original chairs, bedside tables – all together they create a complete and very practical design. In addition, three large windows will be presented with an extraordinary sense of freedom and space. There is shower installed in bathroom. Spacious room with elegant interiors, flat-screen TV and a kettle. A hairdryer and toiletries are provided in the modern bathroom. This room offers more space and an extra large double bed. Bed Size (s): 1 Extra large (Super-king size: 180×200), 1 Sofa bed. 2180 UAH (per 2 persons). 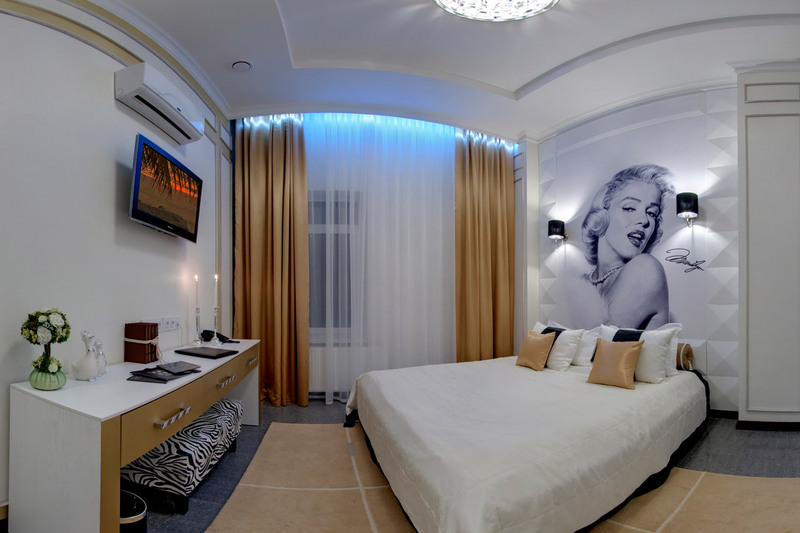 If the famous world celebrity have visited Kharkiv – they would be pleasantly surprised. 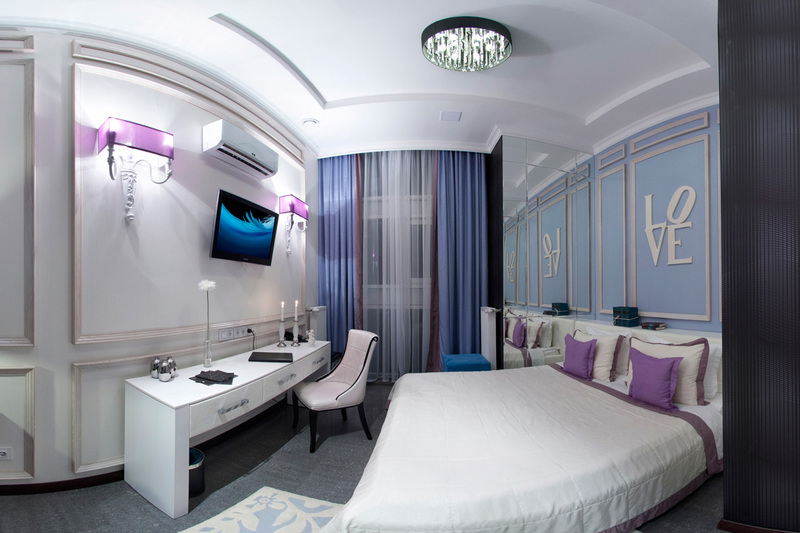 In this number time for black and white, but the purple design of windows and armchairs plus a bit of gold on the lamps and beds brings luxury and chic. In addition,extraordinary comfort creates a decorative fireplace. The feeling of lightness and spaciousness creates a window in the entire height of the room. Particular attention should be paid to the bathroom. Multi-Jacuzzi will remove all tiredness from long working day. Spacious room with elegant interiors, flat-screen TV and a kettle. A hairdryer and toiletries are provided in the modern bathroom. This room offers more space and an extra large double bed. The main emphasis of this number – turquoise details. As the turquoise color has a calming and refreshing effect – completed rest is simply guaranteed. As in all other rooms, there is a king size double bed. Bathroom equipped with shower. Spacious room with elegant interiors, flat-screen TV and a kettle. 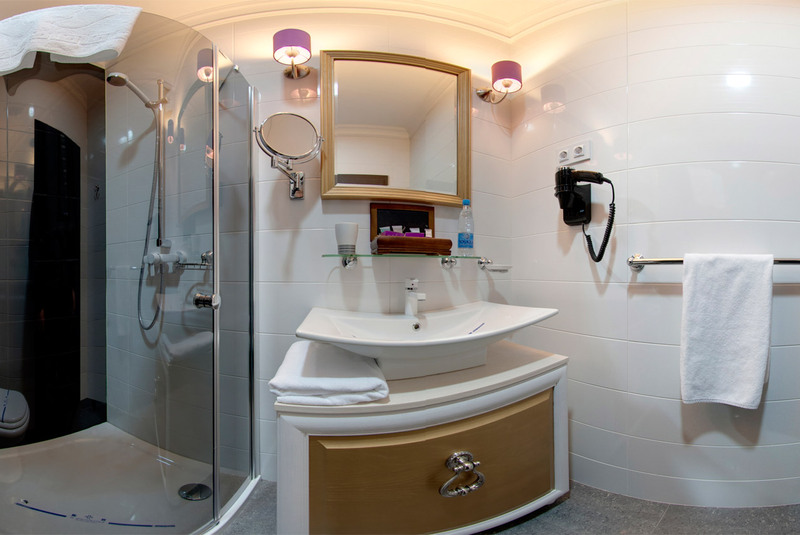 A hairdryer and toiletries are provided in the modern bathroom. 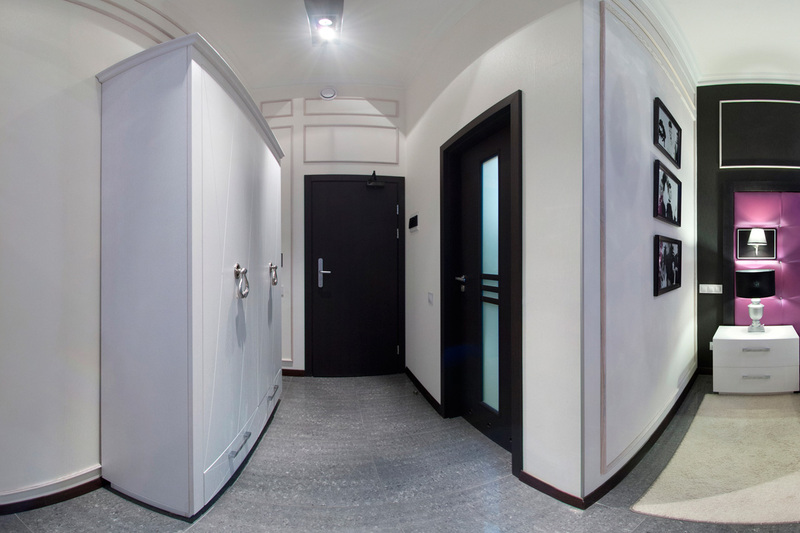 Lightness and easiness – the main theme of this room. This unusual set tables, lamps, and large bed with a unique and luxurious padded quilts will present true relaxation. The traditional presence of many reflective surfaces contribute to the feeling of space and looseness. Bathroom equipped with shower. Spacious room with elegant interiors, flat-screen TV and a kettle. 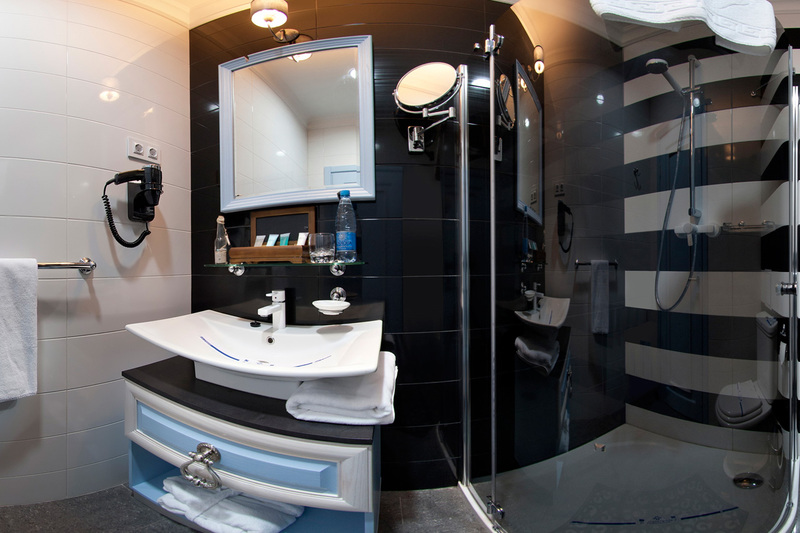 A hairdryer and toiletries are provided in the modern bathroom. Luxurious bed with golden upholstery definitely takes you into romantic atmosphere. There are bedside tables with the original floor lamps. 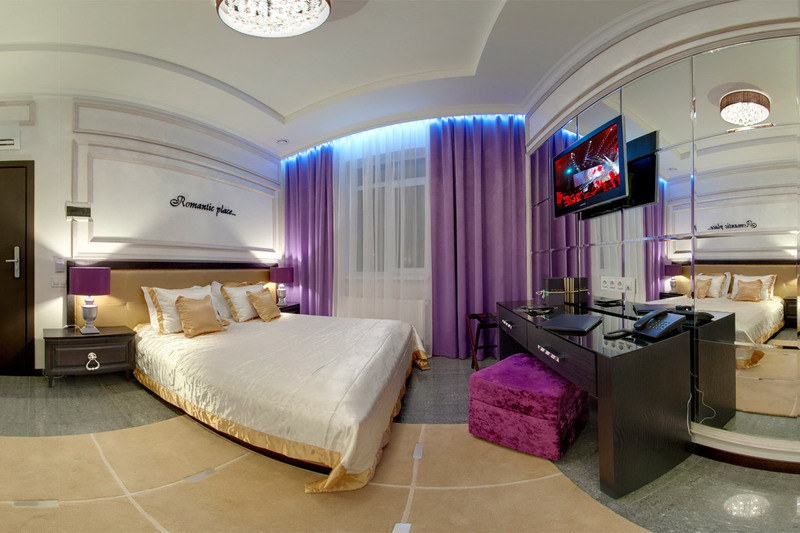 In front of the bed – mirrored wall with a plasma TV. 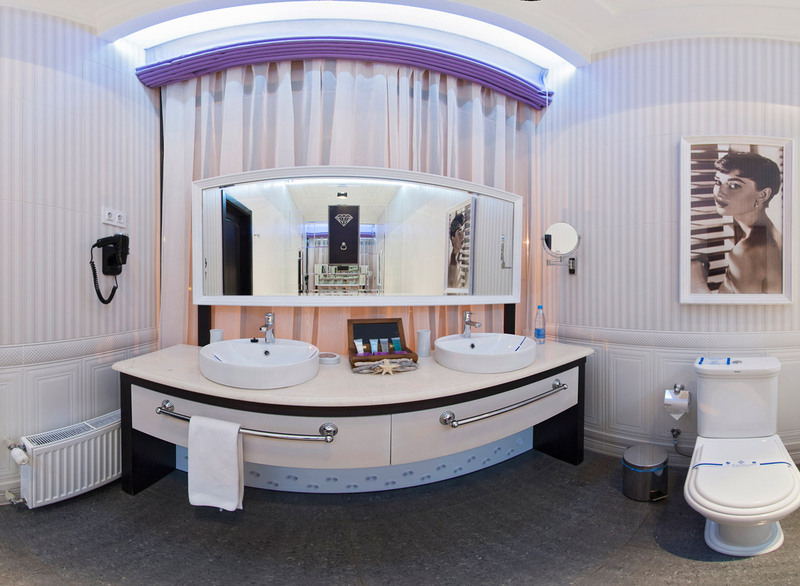 Convenient ultra-modern bathroom design will bring you inside comfort and relaxation. Spacious room with elegant interiors, flat-screen TV and a kettle. 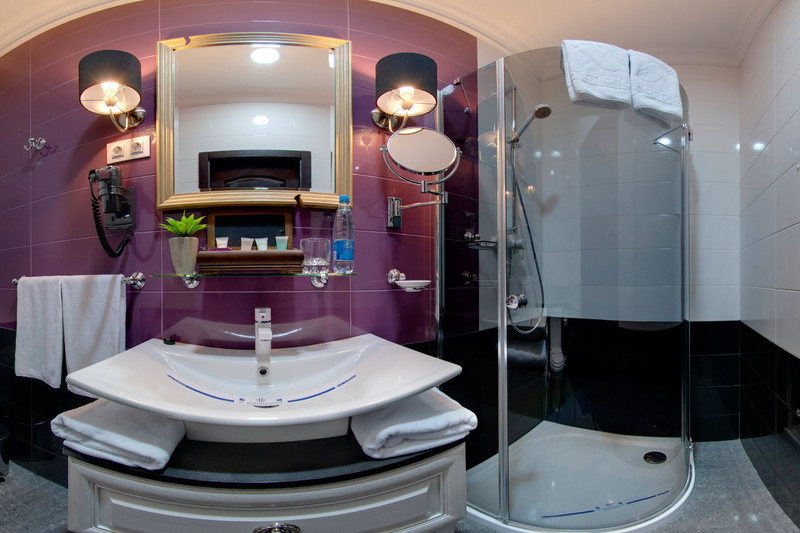 A hairdryer and toiletries are provided in the modern bathroom. 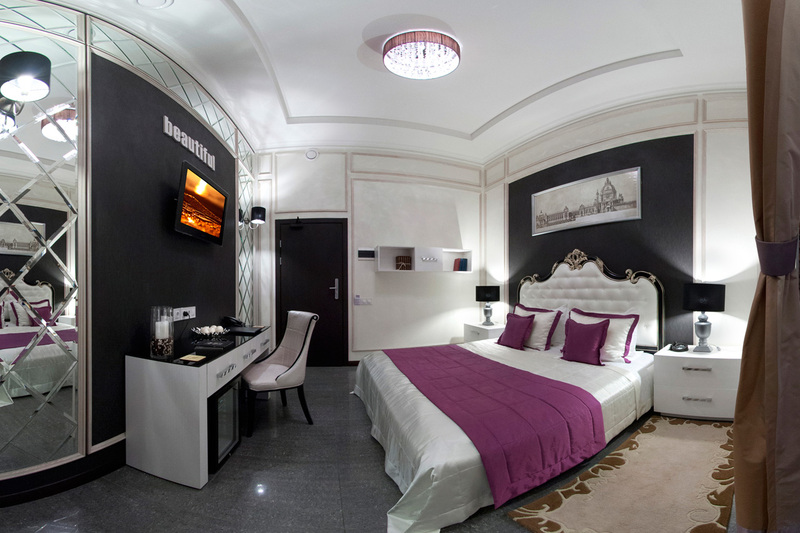 2-room Superior, consisting of a living room and bedroom, will give you a lot of positive and bright emotions! As a guest at your disposal a comfortable sofa, comfortable chairs, a table – all for the reception and evening gatherings. 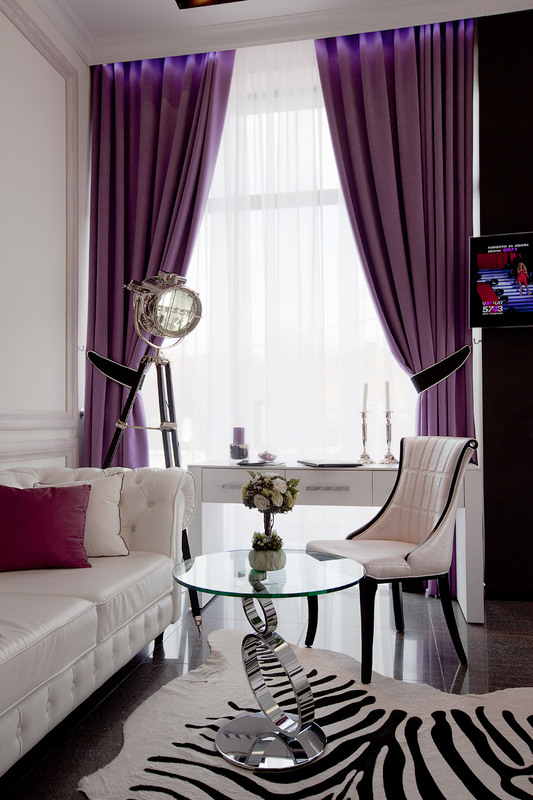 Snow-white bedroom curtains lined purple, providing a soft and soothing effect. 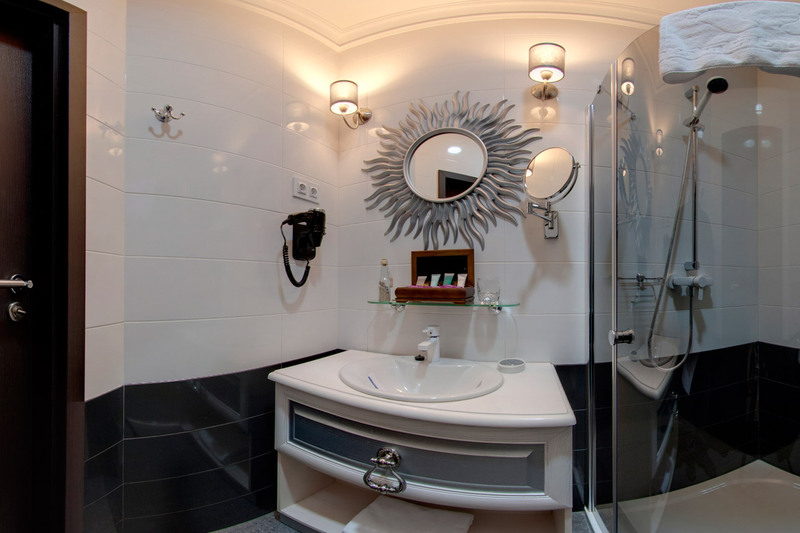 The bathroom has a bath with the classic elements of modern design. Spacious room with elegant interiors, flat-screen TV and a kettle. 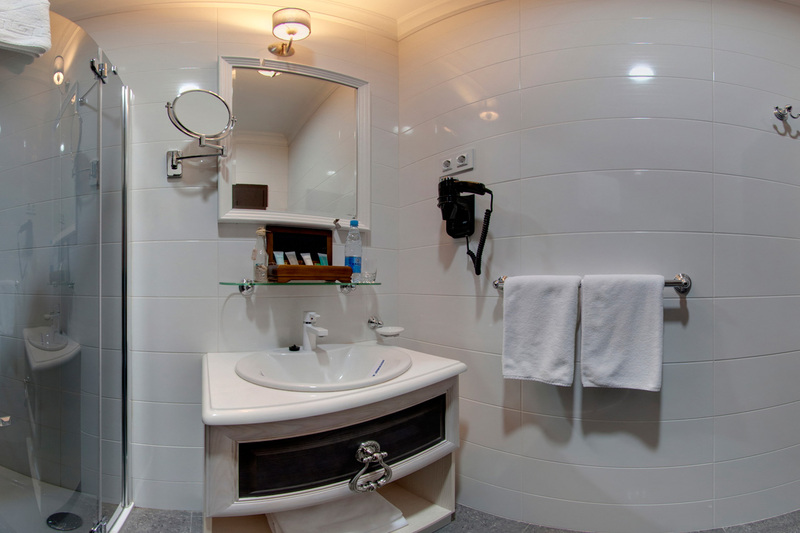 A hairdryer and toiletries are provided in the modern bathroom. This room offers extra space and separate sleeping and living areas. 2580 UAH (per 2 persons). To ask a question, please use the feedback form on the contact page. We are happy to answer all your questions as soon as possible.